Did you work at the Standard or Triumph – at Canley, Radford, Banner Lane, Northey Road, Allesley, Tile Hill, Western Avenue (London), Bordesley Green (Birmingham), Speke (Liverpool), Berkeley Square (London) or any of the associated sites/companies associated with Standard Triumph? If so, we’d love to hear from you to build a database of names associated with the Standard and Triumph company. Read More HERE. There are 222 names in this directory beginning with the letter C.
My father Jack Callen & brother Terry was an apprentice there, I also worked in offices Canley & then we moved to fletchamstead highway, happy times. A close family friend, Cyril Callow worked at Tile Hill Standard as long as I knew him. He never married and his brothers, one was William Callow of Callow and Maddox, and Lord Mayor of Coventry, are all long gone. Cyril was at Tile Hill during the war and I think he worked first at somewhere near Cash's Lane and said Sir John Black was often seen there. He bought a new Standard 8 about 46/7 then a Vanguard KKV866 in 1951 and later taught me to drive in it. He passed away at my parents house in July 1965 after a massive heart attack. He would have been 61. He was a quiet, helpful chap, who enjoyed taking his caravan on holidays, usually with my parents and myself. Still fondly remembered. Assistant Service Manager,London Depot Service Division, Western Avenue c196, who I think previously had worked at Allesley Service Division. 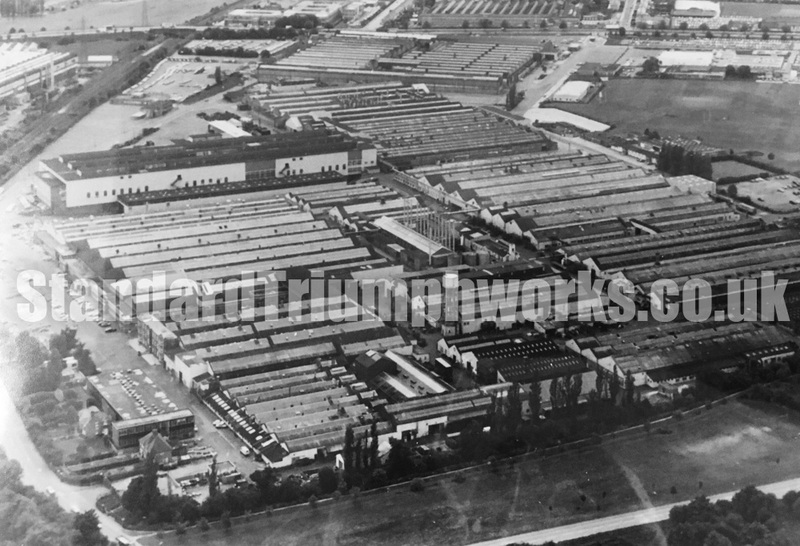 My father started as an apprentice at Canley in c 1936/7. At the outbreak of war he was transferred to the engine (gear box?) plant in Malvern before he was conscripted in 1943. On returning in 1947 he worked for Massey Ferguson for the next 35 years. My father John William Thomas Carver-Smith commonly known as Jack worked in the tool room as a centre lathe turner for many years. He worked first at Cornercroft Engineering (Mr Corner and Mr Croft) but left for more money at Standard Triumph. He returned to Cornercroft for a while but was persuaded to go back to Standard Triumph where he worked until his forced retirement. He drove a Standard Vanguard until 1964 when he bought a brand new Triumph Herald for £515. Ex works. He ran that for ten years and then took advantage of the company discount to buy a Triumph Dolomite. I remember Dad used to do a lot of overtime. Every night and weekends too. 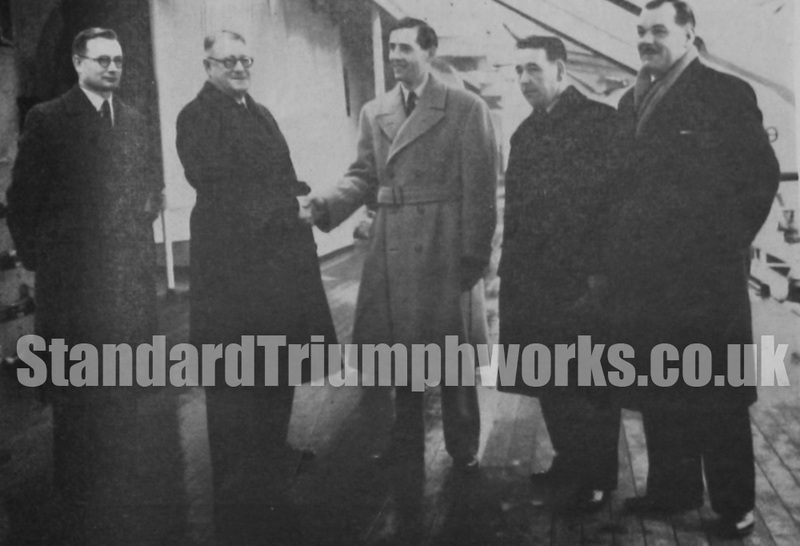 He loved his work at Standard Triumph. I knew a Sheila Cassidy who was in the offices, she was the image of singer Mary Hopkin. Service Engineer, c1954 Updated by: John Chandler. Incl. First name added. "My dad was Overseas Eervice Engineer he went to Iraq and California in the early 50’s also my great uncle Les Mackinson was Foreman in the Experimental Department." Albert began working at Standard Motor Company, before going into the Royal Navy. On his return he went back to the company, where he stayed for 45 years until his retirement. Worked in paint shop,1960's to 70's. Was my Father and he worked in the Maintenance Department at Capmartin Road, Radford. I worked in the Parts Division at Fletch Central from 1971 to 1979 as a Zone Controller and then in JRT when John Egan amalgamated the parts operations of Jaguar, Rover and Triumph into one unit. 40 Years Service. Retired 1972. I was born in Coventry but now live in the North East. I still have close links with my home City and visit regularly. My day, Ray Clay, is now deceased. He was born in Cov 10.2.1924 and died in Walsgrave hospital in 1985. Full name was Raymond Alfred Clay, married to Pearl Sylvia Clay. Dad worked on the 'Track' at The Standard for many years. (Worked alongside family friend, Jack Stanley.) Excellent Boxer, Darts & Snooker player. Top class fisherman (caught second biggest Common Carp of 42lb from Billing Aquadrome in Sept 1966) Second only to Richard Walker's 44lb 'Clarissa' Dad also went on to become a popular steward at The Standard Triumph Social Club for many years. I myself spent many happy childhood days at the club and attended the usual kids events like the Pantomime on the highway! 21 Shop early seventies, working on main wiring harness Dolomites and mk2 2000 and 2.5s. 1300 was just coming to it's final production. Coach painter, Standard Motor Co. Horace belonged to St John's Ambulance Brigade from 1927 to 1942 and served in the army during the war, returning to work as a coach painter at the Standard Motor Company until he retired in 1980. Jack first worked at Tippins in Bodmin Road and then worked at the Humber. He then worked for the Standard Motor Company, and was for many years on the track on the night shift, until he was made redundant. He then worked for the Parks and Leisure department of the Coventry Council for seven years, until his retirement in 1991. In his later years worked on Assembly Shop 6. Did 2 weeks days then 2 weeks nights. Worked at Standard Triumph for I believe 46 years. Purchasing Timing Supervisor at Fletch North, Canley, transferred to Land Rover Solihull, when Jaguar separated from Land Rover about 1980 - 1981. Followed speedway at the Bees, never stopped smiling. Chief Draughtsman, Body Drawing Office, Fletch North. I did my apprenticeship there 1973-1977. My old mate John Costain - wizard of a tinsmith! Originally from Scarborough, Rene moved to the city during the war to work at the Standard Motor Company in Tile Hill Lane where she helped to build Bristol Bombers and Mosquitos. I worked in the bodyshop at standard triumph in the 70's on the Dolomite and Spitfire. Great times there with some brill workmates. I worked in the typing pool, Export Sales, and then moved to be Secretary to the Publicity Manager. Great times and one of the best places to work. Director. 1952-1956 Brother of Arthur F Crosby of AMI (Australia) Clive Crosby was Deputy Chairman of AMI Industrusties in 1959. Arthur F Crosby was Chairman. To add a name, click on the ‘Submit a Name’ link above. Please add the surname first. Use the format: Smith, John in the name field, then add a description; here you can include a role, location, service dates etc plus any other information you think may be of interest, finishing with your name (you may be submitting on behalf of a family member). Don’t worry how much – or little – you write in the description box – everything helps! PLEASE NOTE: By using the ‘submit name’ element on the site we DO NOT get any record of you or your email and sometimes we’d love to get in touch with you, but we can’t! Please either drop your email details on the entry (don’t worry we won’t publish that) or a separate email to say ‘hello’. We’d love you to get involved with this project. You can email us your info to iwas@standardtriumphworks.co.uk or post a name directly on the ‘submit name’ link. A former Director of Standard-Triumph, Harold S. Weale died, aged 70, at his home in Coventry last month. The archive has now over 2,900 name entries and with 566 articles on the site. During May, 2018 we reached 100,000 website hits. Take a look at the Latest News posts to see the articles. Thank you for all the submissions in the database. In addition some people have articles, info, memories and photos. We’ll show everything, that comes in, at some point soon, please bear with us. We still need more… Email your stories today! Would you like to contribute regularly to the site? Let us know. NB. Due to SPAM attacks registration to the site is currently suspended. Genuine people please get in touch via email. Thank you. This website was launched February 1, 2017. Forward Radiator – Part 3 - Weekly staff were paid on a Friday morning, supervisors and management were paid by cheque direct into their bank account about 10 days before the end of each month, that was to allow for post, cheque clearance by the bank. Charles F. Gardner – Director - It is announced by the Standard Motor Co. Ltd,. that Mr. Charles F. Gardner has decided to retire from the Board of Directors. C. A. Phillips – Drawing Office Executive - It is with deep regret to record he death after a short illness of Mr C. A. Phillips, Drawing Office Executive of The Standard Motor Co. Ltd.
Harold S. Weale - A former Director of Standard-Triumph, Harold S. Weale died, aged 70, at his home in Coventry last month. Forward Radiator – Part 2 - You entered first into a reception area with chairs, tables and magazines. The office staff went through a door, on the left was kitchen where Jean Elliot made the tea, next to it was male/female toilets. John (Jimmy) Gunn - We regret to record the death of Mr John Gunn, of the Standard Motor Co. Ltd. Jimmy, as he was known to his many friends, served the company for 30 years. He joined the Lupus Street branch of the London Depot in 1925 and later went to Park Royal. Terry Elliott – Apprentice Metallurgist - Terry Elliott – Apprentice Metallurgist – Standard Motors – 1958-1963 I was fortunate enough to be an Apprentice Metallurgist with Standard Triumph, when I left Coventry Technical School/Woodlands in 1958. 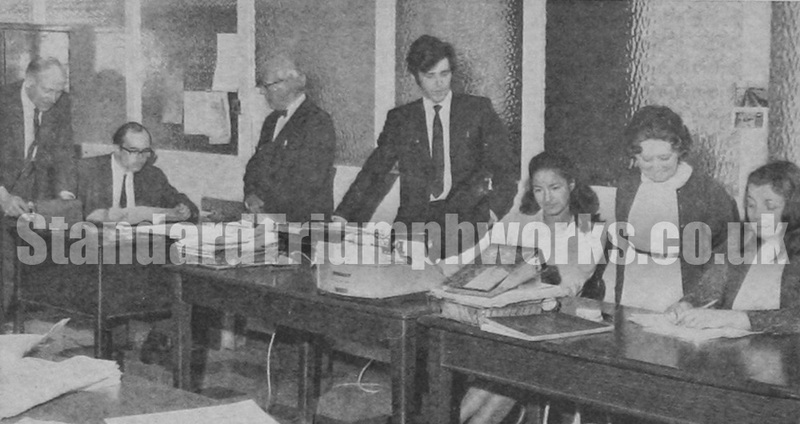 Forward Radiator – Part 1 - I started in the cost and accounts office on Tuesday 8th April 1969, the Monday 7th April was Easter Monday. I was interviewed the week before by Mr Mason company secretary and Mr Digger the works accountant in Mr Masons office. H Edwards – Driving Instructor - As apprentices of The Standard Motor Co. Ltd. are serving their period in the Final Finish Department they now receive driving tuition. W. D. Bradley – Trade Sales Executive - Retiring after nearly 40 years’ association with The Standard Motor Co. Ltd., Mr. W. D. Bradley, Trade Sales Executive at the Company’s London Showroom, recently received a silver cigarette box from the Board of Directors in appreciation of his long service. We’d love you to help with the archive. Send any details in, or contribute to the site regularly. We love to hear the everyday stories that, without you, will be lost. Email us today.